1980-DST is rated 5.0 out of 5 by 8. Rated 5 out of 5 by DIYDave from Vessel Sink or Semi-Recessed Sink Faucet I found a great semi-recessed sink for my bathroom rebuild but a good looking, and right sized, faucet was not to be had. Then I saw this faucet in a local showroom and I had to have it. Well, I had to have two of them. Rated 5 out of 5 by AprilSunday from This product looks really sharp in my country kitchen in Venetian Bronze! I have the Venetian Bronze finish and with a white Corian Sink, it really shows it off. I also have the soap dispenser and sprayer. 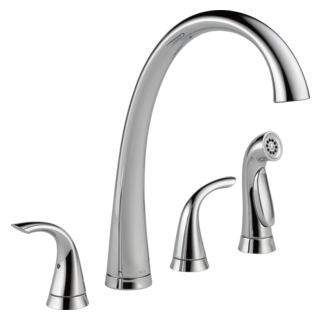 I couldn't do without any of the pieces and I absolutely love the arch of the faucet. The Delta Warranty is not too shabby either. I have only had to use it one time in 14 years of having our home built. We have four baths and two full kitchens. One bath has Jack and Jill sink areas so two faucets and the master has two sinks. Delta has been wonderful to work with. The product I needed to replace was discontinued and they were very helpful finding me a replacement product that I love! I would recommend Delta to everyone! This product in particular. 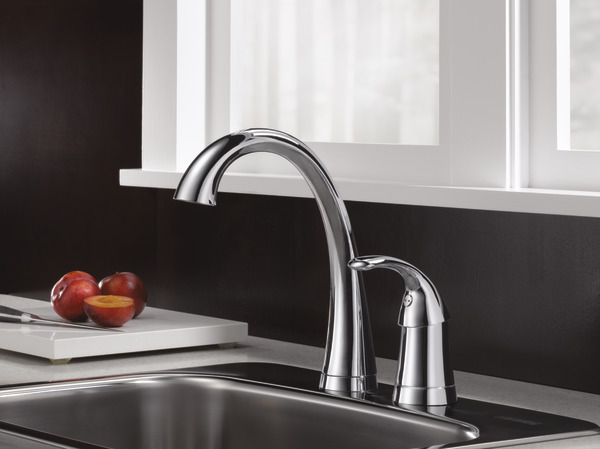 Rated 5 out of 5 by Paula from High arc of spout make this faucet so versatile! This is the second faucet of this type that I have purchased. I have 2 kitchens in my home. The high arc on the spout makes it so easy to fill any size pot or thermos container, and cleaning/rinsing is so much easier with the extra room that the spout provides. I have Delta throughout my home, 4 bathrooms and 2 kitchens. Their tech/parts support is always extremely helpful and their warranties are incomparable. Simple repairs may happen, and the Delta Co., is always extremely helpful and stands behind all of their products. I install and repair myself... simple. I would never purchase any other brand of faucet. Rated 5 out of 5 by VABelle from Great Looking Faucet This bar/prep faucet is a great looking modern design and is the perfect size for the small 23"x22" cabinet and 15"x15" sink in my laundry room. It's very substantial and sturdy. The high curve allows me to fill tall vases and buckets in the sink. I couldn't be happier with this purchase. Rated 5 out of 5 by HomeHelper from Not just for Bar/Kitchen We bought these faucets for both our bathrooms for our ongoing remodel. The sinks we got: the Kohler K-2833 Cast Iron Lavatory Vessel Sink from the DemiLav Collection, and the Xylem SVT 360 seemed to need a larger height/reach faucet than the Delta Lahara faucets we had planed on using. These fauctes fit the bill with 6 3/8" reach and 9 1/2" height and their design is very similar to the Larhara collection (which is used for the tub, shower and accessories). The swiveling faucet also makes cleaning the sink much easier. Rated 5 out of 5 by moman from Tops for Hands Free!! 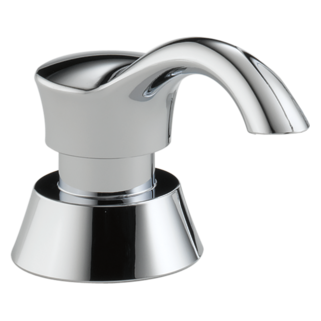 Wonderful hands free on and off faucet with sleek design and easy use! Rated 5 out of 5 by macky1 from beautiful addition! This faucet is beautiful and works like a dream. When I shut it off it does not drip even one more drop!!!! Rated 5 out of 5 by supershopper from problems corrected Parts were finally mailed to complete the faucet and now it works. Is this faucet discontinued or will it be discontinued in the near future? Can this faucet be ordered with a 1.5 gpm laminar flow aerator? I am pretty sure this is the faucet that I have. It is leaking. Can you give me the part numbers to replace the various pieces? I ahve a Pilar single handle The aerator does not work very well and it splashes a lot. The aerator appears to be built into the faucet. Can I change the aerator to a better one that does not splash? Thank you for your question. I apologize that you are having an issue with your Delta Faucet. To ensure there is no debris in the line that is causing the splash, we recommend soaking the faucet head overnight in a 50/50 solution of white vinegar and cold water. How do you clean the aerator. I seem to be losing pressure. 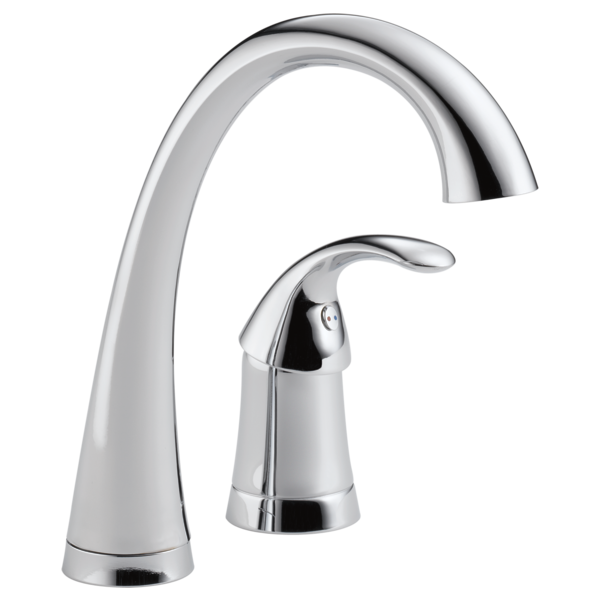 with thePilar single handle faucet---with sprayer &nbsp; 4380-/dst-----would 4&quot; centered holes be OK? I want to add a sprayer/diverter to this. Which model is the best choice? I also wanted a sprayer to go with this bar faucet. &nbsp;I called Delta and asked, and I was told that this faucet was not compatible with a sprayer and the information posted here was incorrect. &nbsp;However, that is NOT true. &nbsp;The faucet IS indeed compatible with the sprayer part numbers mentioned here. &nbsp;Delta&rsquo;s phone-based product support was not correct. &nbsp;You simply remove a plug in the diverter, which comes with the bar faucet, and plug in the sprayer hose.